To navigate our thoughts, to understand ourselves better we often resort to therapy. But how do we know if it’s working for us or not? A really long time ago, when I was not even ten, I heard of therapy for the first time, you know in that passing sense, like how they talk of doctors and recoveries. It was in the context of a neighbor who was known to have frequent outbursts. As is in the way of a child to first believe what they hear, I heard what I heard and believed that whatever this “therapy” was, would “cure” the neighbor alright. Until I learnt that therapy does not cure; therapy “heals”. In my own tryst with therapy, going through it and reading about it, I also realized that therapy can sometimes not do what it’s meant to do. But the million dollar question here is – how does one know therapy is working? The question is a fair one to ask, even if you inherently like your therapist and appreciate the way they work. In my experience, a couple of things seemed to be misleading. 1. The pace at which you proceed in therapy. I remember wanting to work through multiple things and sometimes not knowing if I was done with one process to start with another. I would then question all of it – if I was with the right therapist, if I was deluding myself, if my process seemed bright but would actually come to nothing. I don’t have to tell you how such doubt can make up for rough days. 2. How do you draw a line between all the good things you expect the journey to bring and where you are really on it? Expectation versus reality can be a sore point, especially if you’ve entered the process knowing a fair bit about yourself. Moving forward though, as I learnt to relax and give in more and more, I figured there were real-time signs that I was on the right track. Here’s a broad outline of what I found from my own experience. One of the primary pillars of therapy is “safety”. As much as it is about the confidentiality outlined outright and the way the therapist makes you feel in the very first session, “safety” also has to do with your “gut feel”. 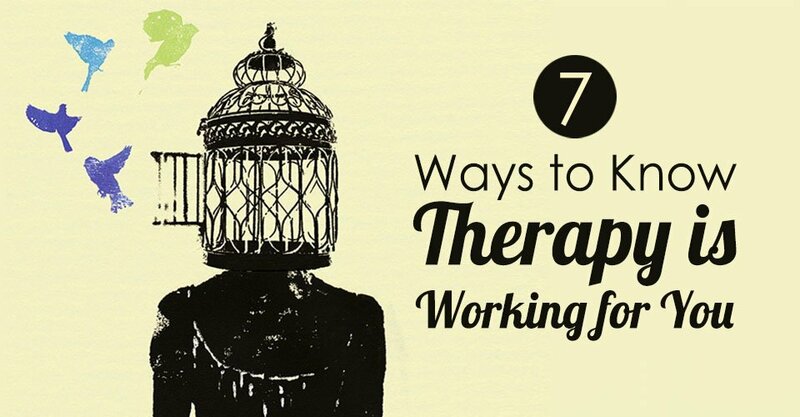 As you go through therapy across several sessions, this will hopefully become clearer. The sense that you’re in the right place – where you feel “held’, where you wordlessly receive complete acceptance, where you don’t feel threatened no matter how intense or emotionally amplified your own story looks or sounds like. As we grow up and grow into our adult selves, we keep garnering qualities that come to our aid. Some of us can think on our feet, some of us can talk really well, some of us know how to survive on very little. In short, we all have inner resources that can help us not just tide by, but also thrive given the right circumstances. Trauma can make people lose sight of this side of themselves. It happened to me and it happens to a whole lot of people. However, if you’re in the kind of therapy that is working in your favor, along with the wounds you’ll soon be able to access the part of yourself that can reintegrate you as a functional and worthy human being. One surefire way of knowing therapy is working is to actually see changes take place. Now on this one I’ve had several debates with people. Some consider changes valid only if they manifest somehow, in behavior, across interactions. I hold a slightly different point of view. In my opinion, a change is anything that makes you experience the world differently. Also, internal shifts happen before change in external behavior. So, look out for how you feel. Take stock of how you are able to process day to day events, specifically those events that can potentially trigger you. Observe if you’re less anxious and are able to sleep better. Such changes, little as they might be at the start, add up in time. In an ideal world, everybody would do what they wanted to do and no one would get hurt. In reality though, that’s never how it plays out. Many of our emotional, psychological and psycho-somatic issues stem from poor boundary definitions. That pattern of not being able to say no, that pattern where you extend help to people even if you’re suffering yourself, that pattern where people doormat you and you keep quiet. You see how a lot of root causes actually grow out of that one seed cause – poor boundaries. Therapy can often help people improve this side to their engagement with themselves and the world. And if it does, steadily and increasingly, you know you’re on the right path.